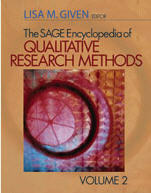 Become better acquainted with the elements of qualitative research by browsing the Sage Encyclopedia of Qualitative Research Methods, now available online along with over 200 other specialized and authoritative encyclopedias produced by Sage Publishers. As an added bonus, the Sage e-reference collection offers a citation tool allowing you to cite encyclopedia articles in correct APA style. Other useful features are the numerous active hyperlinks to supplemental readings, as well as the capability to send articles by e-mail. I am currently studying for the NLN CNE certificaion exam, this blog contents was recommended as a resource and it has been very helpful in preparation for the exam. It is not only an excellent resource for the exam, but also an excellent resource for the novice nurse educator. For those of us in nursing education for a number of years, this blog is excellent at refreshing us and providing new ideas and innovations in nursing. Thanks for the feedback! I’ll do my best to keep the blog updated and fresh.